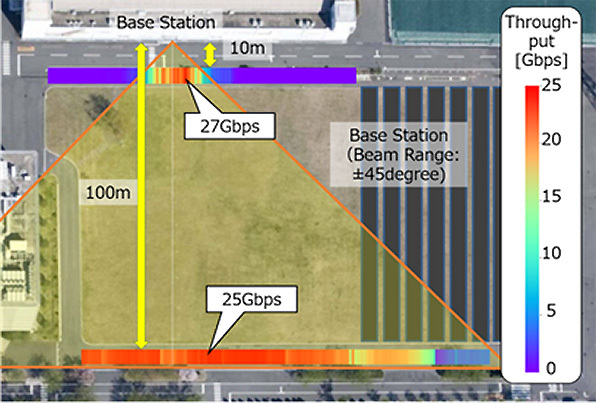 For outdoor trials using the 28GHz band, Mitsubishi Electric used an antenna system with 16-beam spatial-multiplexing technology1 . Base-station antennas installed on the wall of a building directed beams to mobile-terminal antennas installed on the rooftop of a vehicle. Using 4G systems, it has not been possible to establish high data-rate communication for a single mobile terminal using more than four streams. 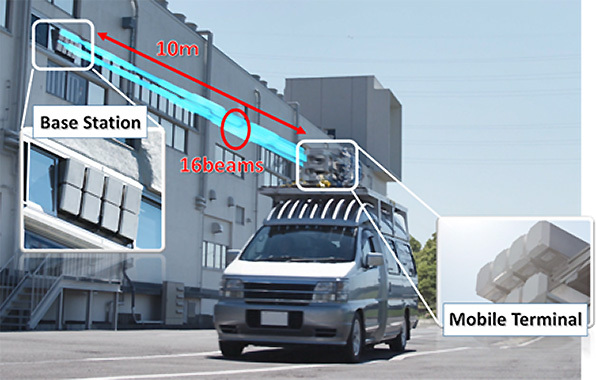 Mitsubishi Electric and DOCOMO carried out 28GHz-band outdoor field trials to verify the feasibility of 16-beam spatial multiplexing in line-of-sight conditions4 , where massive-element base-station antennas installed on the wall of a building directed beams to mobile-terminal antennas installed on the rooftop of a vehicle. The mobile terminal moved along two different streets. The distance of one mobile terminal was 10m from the base station and the distance for the other was 100m (Fig. 1). The trials achieved the world's first successful wireless downlink transmissions at data rates of 27Gbps and 25Gbps when the distance between the base station and the mobile terminal was 10m and 100m, respectively. The achieved peak data rates correspond to spectral efficiency of 67bps/Hz5 , believed to be the world's best performance for 28GHz-band mobile telecommunication.